Surely we all are well aware of upcoming Galaxy unveiling event held by Samsung. We are hearing a lot and seeing a number of faces about Galaxy S III. There are so many leaked information is available in internet about various features of Galaxy S III. We are not sure yet what to believe. This time surprisingly Amazon is on the list too. 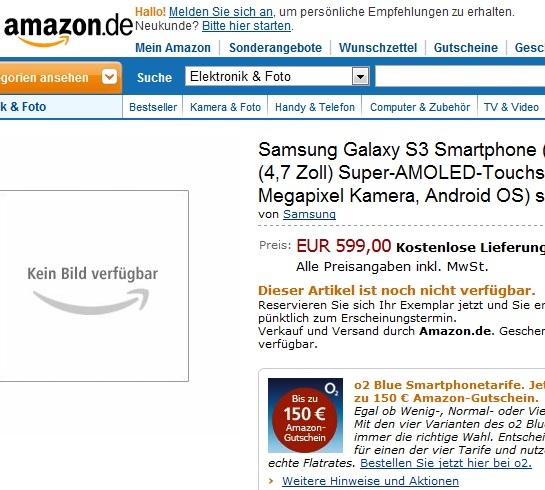 Amazon Germany has listed the Samsung Galaxy S III for pre-order, thus possibly revealing some of the upcoming flagship's specs. The Samsung Galaxy S III is listed as sporting a 4.7" Super AMOLED screen and a 12MP camera. 12MP camera is a surprise for everyone, because till now we heard Galaxy S III has an 8MP camera module. Let’s wait and see. The phone's memory is listed as 16GB, which is further expandable up to 32GB. And obviously you will see Android Ice Cream Sandwich OS beneath your Galaxy S III. German Amazon asks €599 for the 3rd generation Galaxy S III, which is likely to be $790. Its price by the way does include VAT.